Line from the film: "Our culture is all about the sea"
Seeing as I’ve already covered Highwater, Step into Liquid, and Riding Giants, I guess it’s no secret that I’m a big fan of surfing documentaries. Though I’ve never surfed myself, there’s something about watching others glide along the water at top speed that I find totally exhilarating. 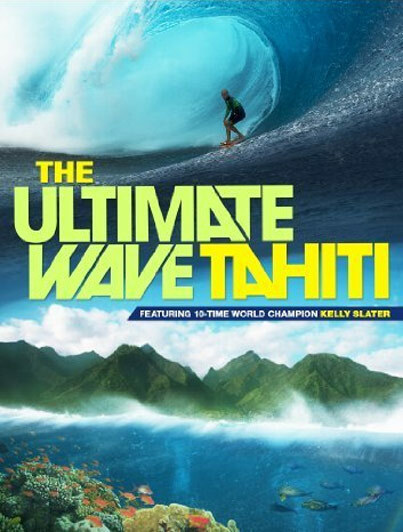 Yet of all the surf movies I’ve seen thus far, 2010’s The Ultimate Wave Tahiti is, quite possibly, the most striking of the bunch. Directed by Stephen Low and narrated by Michael Hanrahan, The Ultimate Wave Tahiti follows 9-time surfing champion Kelly Slater and his good friend Raimana Van Bastolear as they make their way to Teahupo, a secluded spot on the far end of the island, where they hope to ride what the locals call the “Demonic Waves”, the hugest in all of Tahiti. Joined by some of their friends, the two wait patiently for these humongous swells to arrive, passing the time by taking in the beauty that the surrounding “Garden of Eden” has to offer. In typical IMAX fashion, The Ultimate Wave Tahiti features one stunning view after another of this tropical paradise, from an aerial tour of French Polynesia to gorgeous underwater photography, where we see waves roll overhead and gaze at the various sea creatures that call Tahiti their home. As for the surf scenes, they’re amazing; to enhance the excitement of watching Slater and his pals in action, director Low attached a small camera to the front of each surfboard (aimed backwards), thus capturing the joy and anticipation on each surfer’s face as they make their run (many of which play out in slow motion). In The Ultimate Wave Tahiti, even a simple moment can be breathtaking (at one point, as Slater, Raimana, and a friend are walking along the beach, there's a rainbow behind them, stretching off into the distance). 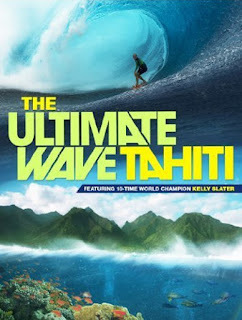 And for those who aren’t fans of surfing docs, The Ultimate Wave Tahiti has plenty for you as well (the surf action doesn’t begin until the halfway point of the movie), including a CGI-enhanced tour of our solar system (a lesson of sorts about how the sun and moon affect the size of waves on earth), a tribal dance (to appease the Gods and ask them to bring big swells the next day), and a whole lot of scenery. Thanks to the high-definition equipment that Low and his crew utilized throughout its production, The Ultimate Wave Tahiti looked incredible even on my meager home system. Had I seen it on an IMAX screen, it probably would have blown my mind.